Last week, in an unprecedented move, the U.S. Supreme Court ruled 5-4 to stay EPA’s Clean Power Plan. While this is certainly a setback for the CPP at the federal level, it is clear that work will continue at the federal and state levels in a variety of forms. 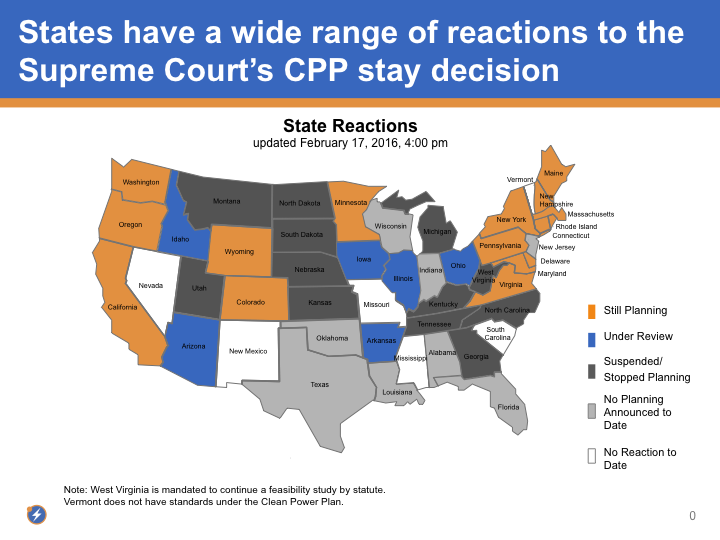 Since the stay, many states have weighed in on the decision: 16 states will continue to plan for compliance with the rule, 12 states have suspended planning efforts, eight states have yet to announce any planning process, and six states are still reviewing their options post-stay. AEE will continue to monitor states’ actions in the aftermath of the ruling. Here is what we know so far. States’ formal responses to the Clean Power Plan have been varied, per public statements. Below we summarize formal responses to the Clean Power Plan state by state, with links to original government sources and to public statements covered by national and state news reports, including E&E's Power Plan Hub. In some states, no public statements have been made yet, although we are monitoring reactions closely. While these public statements are a useful indicator of the state’s future plans on the CPP, note that some states will continue working on the issues raised in the CPP planning process both formally and informally. EPA set no targets for Alaska in its final rule. Stakeholder meetings are still moving forward. Arkansas Department of Environmental Quality Director Becky Keogh and Arkansas Public Service Commission Chairman Ted Thomas in a joint statement said they were pleased with the decision but would "strive to balance our obligation to be wise stewards of taxpayer money with our obligation to be fully prepared should the Supreme Court ultimately uphold the plan." Planned stakeholder meetings are still on, but the Administration is reviewing the ruling. In the most recent technical committee meeting (2/10), state regulators indicated that although it would meet less frequently, the technical workgroup would continue its work. It is likely that the general stakeholder meetings will cease. "We've not made any long-term decisions as an organization, but for the short term, there is continued value in proceeding down the path of finishing at least some of the technical work we had started." The state will continue to plan. The state will continue its planning. "Connecticut is already a national leader on global warming - and that will not change. We're going to continue to cut carbon in a cost-effective, reliable manner while growing a clean energy economy. Through programs like the Regional Greenhouse Gas Initiative, we already have achieved significant reductions in carbon pollution from the electric sector, while growing our economies and maintaining reliable power. We have an obligation to combat greenhouse gases, and Connecticut is going to continue to do just that." Florida is reviewing the rule and will determine next steps accordingly. While the state was considering opening a stakeholder process which would include public meetings and a comment period, it is unclear whether that process would continue. Georgia has suspended its planning. “We are pleased that Georgia will not need to begin plan development at this time given the uncertainties surrounding its ultimate legal status,” said Mary Walker, an assistant EPD director. EPA set no targets for Hawaii in its final rule. Idaho is reviewing the rule. Idaho will continue to monitor the legal challenge of the CPP and provide updates as applicable. Illinois has yet to announce a stakeholder process but has announced that it would move forward with its stakeholder meetings. Indiana will continue to not plan. Iowa is reviewing the ruling and determining next steps. "This is a very complex rule; it has been since the beginning," said Ben Hammes, a spokesman for Iowa Gov. Terry Branstad (R). "The decision yesterday only makes it more complex." The Kansas Department of Health & Environment has cancelled listening sessions while the stay is in effect. Kentucky has put a pause on listening sessions. “Conducting listening sessions at this time is premature because the CPP could change substantially as a result of litigation, or it could be vacated altogether. The CPP’s unprecedented requirements have placed states in an untenable position relative to electricity generation, threatening energy affordability and reliability,” said Energy and Environment Cabinet Secretary Charles Snavely. No planning announced to date. Newly instated Governor Edwards and Secretary Brown have not made any statements thus far. Attorney General Jeff Landry released a statement that the Supreme Court’s “decision prevents the EPA from forcing compliance on our State before we have the opportunity to challenge this invalid, expansive rule. I will continue to work with my fellow Attorneys General from across the country to ensure Louisiana workers, job creators, and consumers are not burdened by the EPA's overreach." The state will continue planning via RGGI. Maryland will continue planning via RGGI. "We are confident that once the courts have fully reviewed the merits of the Clean Power Plan, it will be upheld as lawful under the Clean Air Act. Our coalition of states and local governments will continue to vigorously defend the Clean Power Plan - which is critical to ensuring that necessary progress is made in confronting climate change." The state will continue support for the CPP. "The states involved [in RGGI] are proud to have reduced CO2 emissions by approximately 40 percent in the last 10 years," she said. "So, we're working our tails off, because it's the right thing to do for our economy and for our people's health." Gov. Rick Snyder announced that Michigan would suspend its planning while the stay is in effect. Minnesota has announced that it is still planning — via Twitter. The Missouri Department of Natural Resources has not reacted to the ruling. The DNR had no previously scheduled CPP listening sessions. Updates can be found on DNR’s CPP page. Mississippi Gov. Phil Bryant threatened to not comply with the rule in July, but has not made a statement about the stay decision. The Department of Environmental Quality still has a Public Forum scheduled for February 23. Updates can be found on DEQ’s Calendar of Events. The state has suspended its formal CPP planning process but will continue to work on energy planning to deal with the issues raised by the CPP. Gov. Steve Bullock (D) suspended the stakeholder committee. “What we cannot put on hold, however, is the need to address climate change and embrace Montana’s energy future, and I am committed to ensuring we do so on our own terms,” he said in a statement. The state has suspended its planning process. "We are pleased the Supreme Court recognizes that the federal power plan will dramatically increase North Carolina's electricity rates with little, if any, environmental benefit,” Governor Pat McCrory said. "We will continue to fight the Obama administration's illegal attempts to take over North Carolina's power system." "The decision by the Supreme Court to halt the implementation of the Clean Power Plan until a legal settlement is reached is important for Nebraska industry and ratepayers to prevent rate increases. I applaud Attorney General Doug Peterson’s continued work to defend Nebraska against EPA overreach,” Ricketts said in a news release. New Hampshire will continue planning via RGGI. The state will continue to not plan. The New Mexico Environment Department has not reacted to the ruling, but had no previously scheduled meetings. Updates can be found on NMED’s CPP page. The state has made no public statement on its planning process. On a conference call for the Governors’ Accord for a New Energy Future on Tuesday, February 16, Governor Brian Sandoval said that Nevada, for the most part, already complies with the CPP. The state is in a good position to comply, and will keep moving forward with their existing foundation already in place. New York will continue planning via RGGI. The state is reviewing the rule. The state will not be planning for compliance. “Since the Supreme Court has stayed implementation, Oklahoma no longer faces a September compliance date and can focus on assisting the attorney general on overturning this rule." The state is continuing its planning process and still intends to submit a final plan in 2016. The state will plan through RGGI. No comment has been made from Rhode Island yet, but the state has already committed to compliance through participation in RGGI. The state is likely to continue its planning process. Kyrik Rombough, an engineering manager in the air quality program at South Dakota's Department of Environment and Natural Resources, said the state would suspend a series of five public meetings scheduled to begin later this month in Milbank, SD. The state suspended public listening sessions until a later date. Texas will continue to not plan. The state suspended its planning process. Virginia will continue its planning process. EPA set no targets for Vermont in its final rule. Washington will continue its planning process. “We cannot afford to wait any longer for federal action to address carbon pollution and transition to clean energy. Here in Washington state we are unfortunately already seeing the harmful impacts of climate change, and we will continue to take steps that reduce carbon and to lead the nation in clean energy. The EPA’s Clean Power Plan remains a crucial tool to ensure that every state must do its part, and to empower them to do so. Wisconsin will continue to not plan, per Executive Order of the Governor. The Supreme Court’s decision was "a win for Wisconsin and the other states joining with us in challenging the overreach of the Obama administration." West Virginia must continue its feasibility study per its statute but will otherwise suspend planning. The state will slow but continue its planning process. "We don't want to just put all our eggs in a single basket, and that is the court system," Mead said. "So I think we will continue -- maybe not at the same pace -- but I think we will continue to have our [Public Service Commission] and [Department of Environmental Quality] and others at the state see what this would mean."